This South Nags Head ocean side vacation rental cottage offers beautiful views of both the sound and ocean - enjoy it from a large sundeck area. The cozy loft area has an access to another deck. Make a bbq on a charcoal grill outside and then watch a movie on a DVD player. The outside shower is here for you to wash off your sandy feet after a relaxing day on the beach. 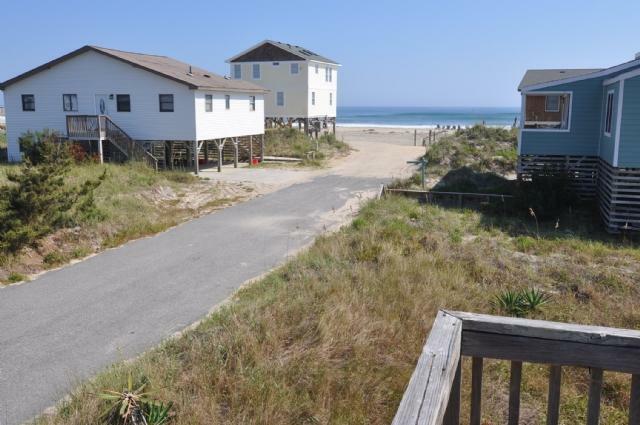 Enjoy a fabulous vacation in this comfortable and well-equipped South Nags Head home. This is also a pet friendly cottage, so bring your dog with you to enjoy vacation together. Just 45 yards to beach. Located at MP 20.5 in South Nags Head. "We are repeat renters of Clementine and absolutely love it! It feels like home."